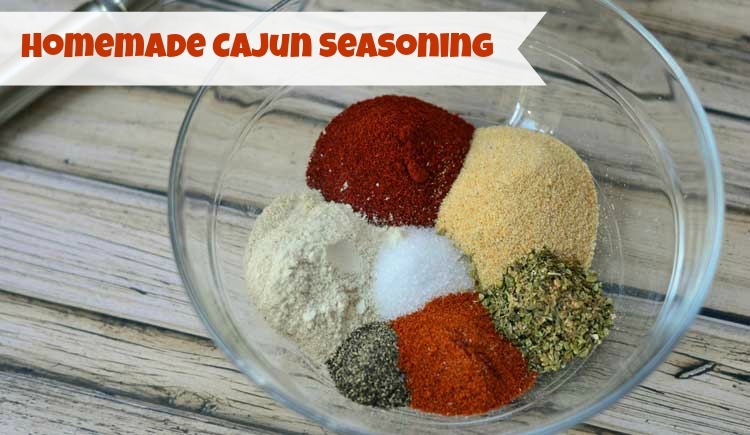 Make your own Cajun seasoning with just a few spices that are already in your spice cabinet! A few weeks ago I made Shrimp Etouffee for the first time and it has quickly become a favorite dinner. One of the ingredients in the etouffee recipe is Cajun seasoning. Of course you can buy Cajun seasoning, but I prefer to make my own seasonings whenever I can – like my homemade taco seasoning and Italian salad dressing mix. I like to be able to control the amount of salt in the seasoning and in this case, the amount of heat. 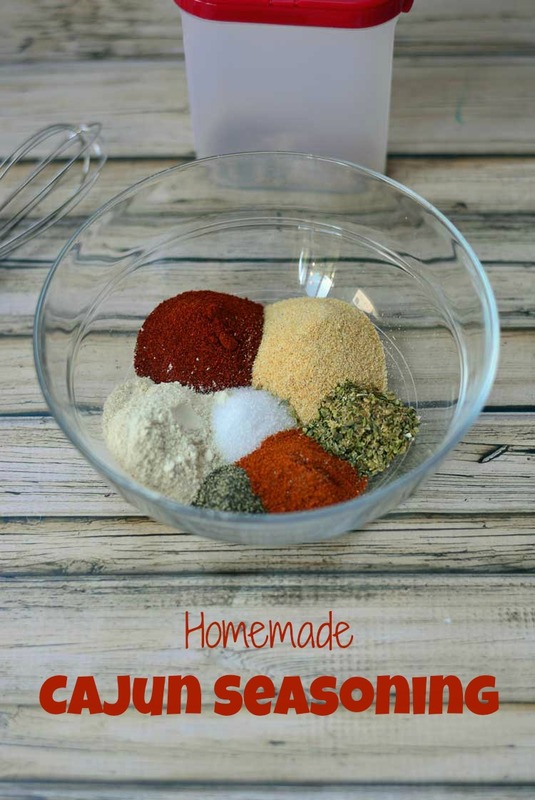 Homemade seasoning mixes are easy to make. I generally make a large amount and then store the mixes in a Tupperware spice shaker to keep them fresh longer. 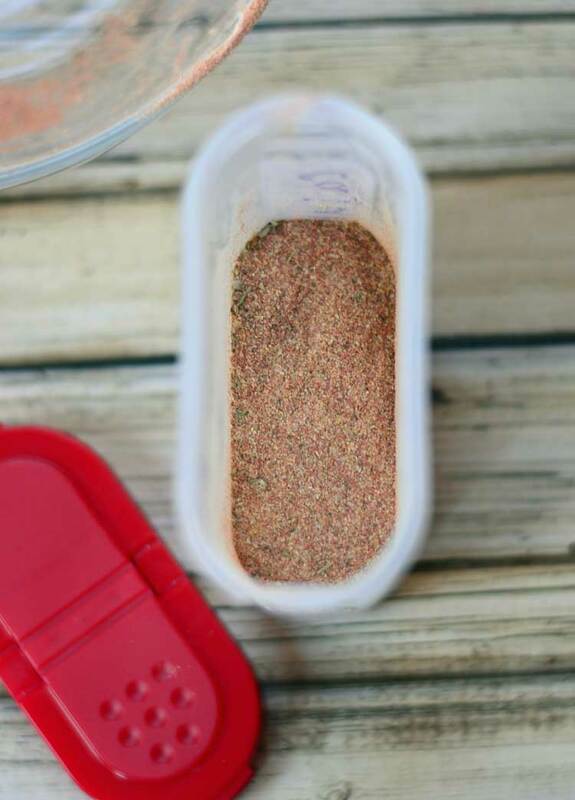 The Cajun seasoning mix is good for about 3 months, but will last longer in a Tupperware shaker. This Cajun seasoning recipe is actually from my friend, Suzy. Suzy's quite the cook but alas she doesn't have a blog for me to send you to. She actually won a Taste of Home cooking competition a few years ago! The recipe calls for 2 Tablespoons of cayenne pepper but you can add more or less to make it spicier or less spicy. I also ran out of thyme a few months ago and keep forgetting to buy more so this last batch didn't have any thyme and it tastes fine. That's what I love about homemade spice mixes – you can customize them to your own tastes based on what you have on hand. 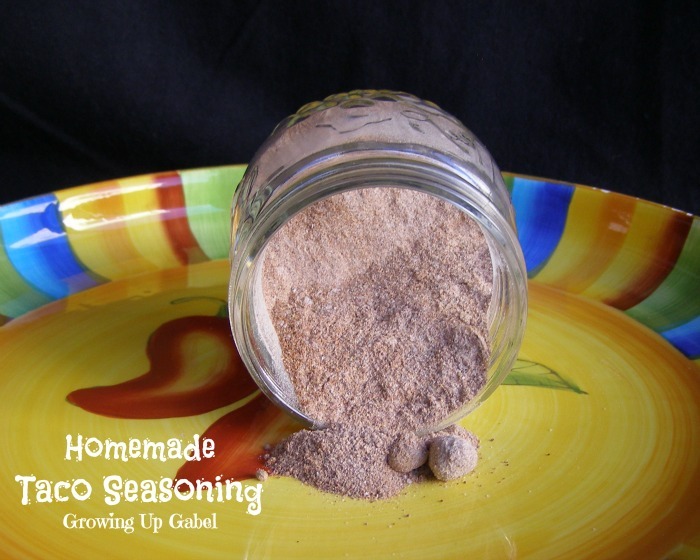 If you like to make homemade seasonings check out my homemade taco seasoning recipe! You can also make your own Italian salad dressing mix! Combine all the ingredients thoroughly in a bowl. Store in an airtight container away from light. Use within three months. Thanks Camille for the seasoning recipe. So expensive in the stores. I enjoyed reading this post! Thanks for sharing at Wordless Wednesday. Don’t forget to stop by again this week! Pinned! I also prefer to make my own spice mixes to control the ingredients. Thanks for sharing! You are so welcome! I love a well stocked spice cabinet for sure. I have always thought it would fun to make my own spice mixtures. I will have to give it a try! Thanks so much for linking to the This Is How We Roll Thursday link party! I can’t wait to see what you share next week! I am always interested in making my own spice blends. I’ll have to give this a try. I have never thought of making my own spices! Such a great idea, I can’t wait to try it! Saw this post over at Its Time to Party: Fluster Buster! Pinned it and now going over to check out the homemade taco seasoning! Thanks for the inspiration! You are so welcome! Homemade seasonings are so easy to make. Love the recipe! I hate buying mixed spices because they have so much salt. We don’t season with salt because we can’t stand the taste. I never really thought about making my own mixes until last week. Thanks for the recipe!! I love homemade spice mixes! There are so many you can make on your own.